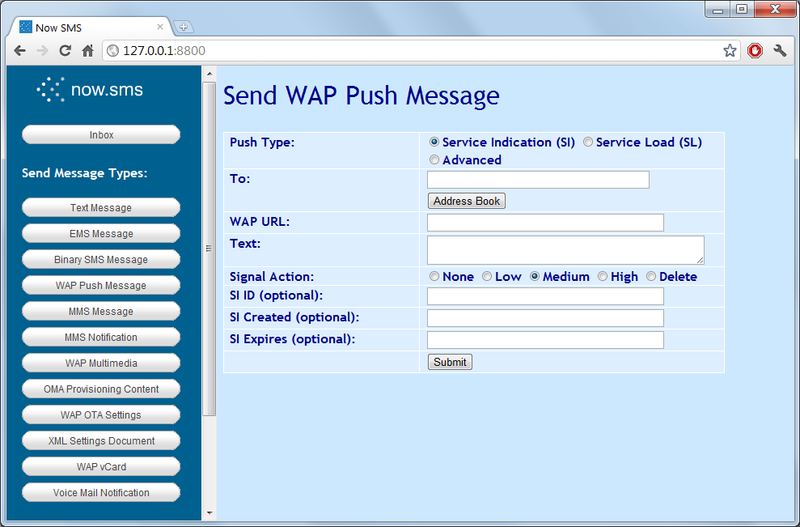 This web form provides a simple interface for sending a WAP Push message. 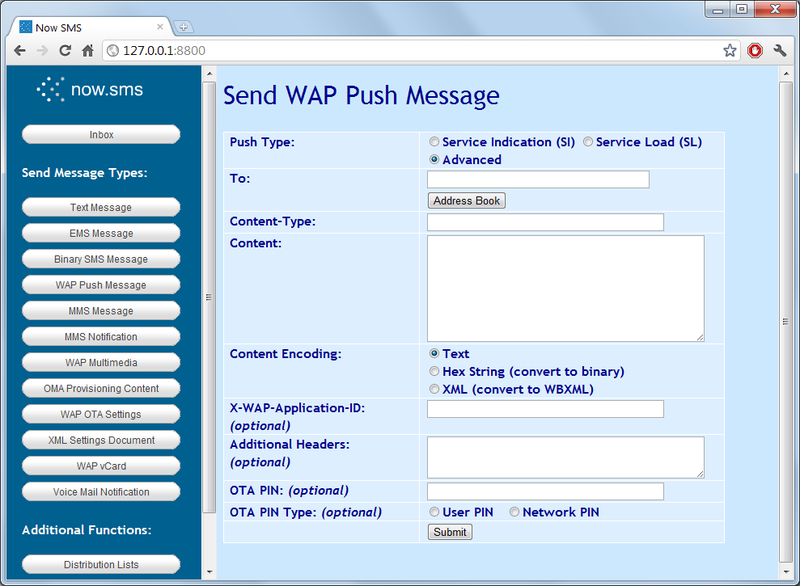 Two basic types of WAP Push messages are supported from the web interface, Service Indication (SI) and Service Load (SL). The menu will change slightly depending upon whether Service Indication or Service Load has been selected as the “Connection Type”. The web interface also provides an “Advanced” option for generating WAP Push messages of any content type, including custom WAP Push WSP headers, which is useful for testing and experimentation. A Service Indication message is what we think of as a standard WAP Push message. The push basically consists of some text and a URL. When the push is received, the mobile phone shows the text, along with an option to load the URL. A Service Load message is a type of WAP Push that was designed for system applications. The push does not allow any text to be sent, only a URL. The original design intent was that the mobile phone would automatically open the URL without user intervention. Of course, this presents significant security concerns, so many mobile phones either do not support Service Load, or they treat it the same as a Service Indication message, with the disadvantage that the push cannot include any text to identify it. Frequently this type of message results in a message on the phone indicating “Service Message Received”, with an option asking if you wish to load the URL, and no further information. We recommend using the Service Load type of push only for specialised applications, while the Service Indication type is for general use. “Phone Number” specifies a comma delimited list of recipients to receive the message. “WAP URL” specifies the HTTP URL to be associated with the push. (If the user chooses to load the push message, they will be connected to this URL.) If the http:// prefix is not included, it will be assumed. “Text” specifies some text to be displayed when the push message is first opened. This text is typically displayed along with a link to load the URL associated with the push. “Signal Action” can specify a different type of alert to be associated with the push. While this is not very widely supported, the general intent is to associate a priority with the alert, so that the device might take greater action to alert the user to a “High” priority push, as opposed to a “Low” or “Medium” priority push. Of particular interest in the “Signal Action” options is the “Delete” action. If a push has an “SI ID” associated with it, it is possible to later send a “Signal Action = Delete” push with the same “SI ID” to delete the previous push message from the device inbox. Similarly, if a mobile device receives a push message with an “SI ID” that matches that of a previously received push that is still in its inbox, the new push message should replace the existing push message. The “SI Created” field specifies a creation date/time stamp to be associated with the push. If specified, this date/time stamp should take the format “yyyy-mm-ddThh:mm:ssZ”, specifying a date/time value relative to GMT. For example, “2006-02-24T00:00:00Z”. The “SI Expires” field specifies a date/time at which the receiving device should automatically expire the push. This is a date/time value relative to GMT, in the format “yyyy-mm-ddThh:mm:ssZ”. For example, “2006-02-24T00:00:00Z”. The “Advanced” WAP Push form allows for the sending of WAP Push messages of any content type, and supports the ability to include custom WAP Push WSP headers. The “Content-Type” field should contain the MIME content type of the content to be pushed. The “Content” field should contain the content of the push. The content can either be encoded as plain text, or for binary content types the content can be represented as a string of hexadecimal characters. The “Content Encoding” field specifies whether the content is plain text or a string of hexadecimal characters. If you are sending one of the content types supported by “Send XML Settings”, but wish to include extra headers, it is also possible for NowSMS to perform XML to WBXML conversion for any of the XML content types supported by “Send XML Settings” (see page 118). If you wish to have NowSMS perform XML to WBXML conversion, select this conversion option for “Content Encoding”. The “X-WAP-Application-ID:” field can contain a numeric identifier or text string to indicate a destination WAP Push application id. The “Additional Headers” field can contain a list of additional headers to be included in the WAP Push WSP header. Each header should be on a separate line, with a format of Header-Name: Header-Value. As an alternative to text encoding, WSP headers can be specified directly using with hex string encoding. When NowSMS encounters a line of hex characters in the “Additional Headers” field, it assumes that this a pre-encoded WSP header value, and the binary equivalent of the hex string is included in the WSP header without any validation. “OTA PIN” and “OTA PIN Type” can also be optionally specified to allow the push message to be signed.